Rap fans will be able to read the lyrics to their favorite songs while guzzling Sprite this summer. 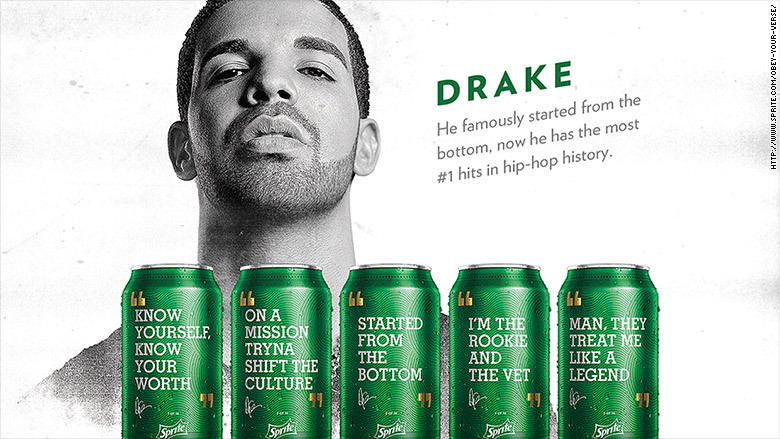 Cans of the citrus-flavored soda will be emblazoned with inspirational quotes from hip-hop stars Drake, Nas, Rakim and Notorious BIG. The quotes include "Know yourself, know your worth," from Drake's 2015 album and "Cool 'cause I don't get upset," from Rakim's "Microphone Fiend." The #ObeyYourVerse campaign is the latest in a string of advertising stunts by food and beverage companies that involve custom messaging on products. Coca-Cola (KO) is also running its "Share a Coke" campaign with hundreds of first names and several common nicknames emblazoned on cans and bottles. Frito Lay, a division of Pepsi (PEP), is giving potato chip lovers the chance to have a selfie printed on a bag of Lays. Appropriately, but sadly for some hip hop fans, the Sprite campaign does not include lyrics from more controversial rap legends like NWA, Public Enemy, Snoop Dogg or the Insane Clown Posse.